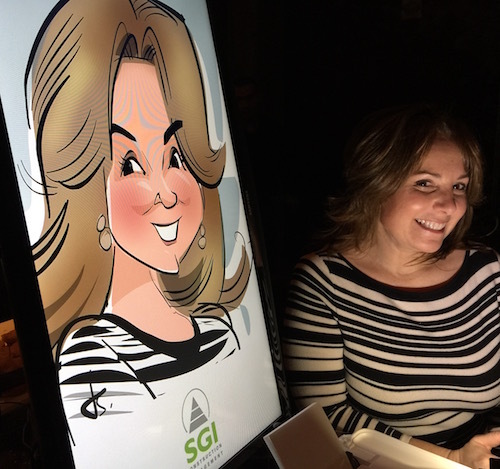 State of the art technology combined with the country's top caricature talent makes for an experience your clients and guests will want to share! Make them walking billboards for your brand! Entertain your guests with the best talent. Multiple artists serving any location. Draw traffic, build community and send them home with swag to brag about. Artists who draw at home in their jammies serving your clients anywhere in the world! One of the advantages of swag that attendees actually want and will not throw away is that they will actually line up to get it. 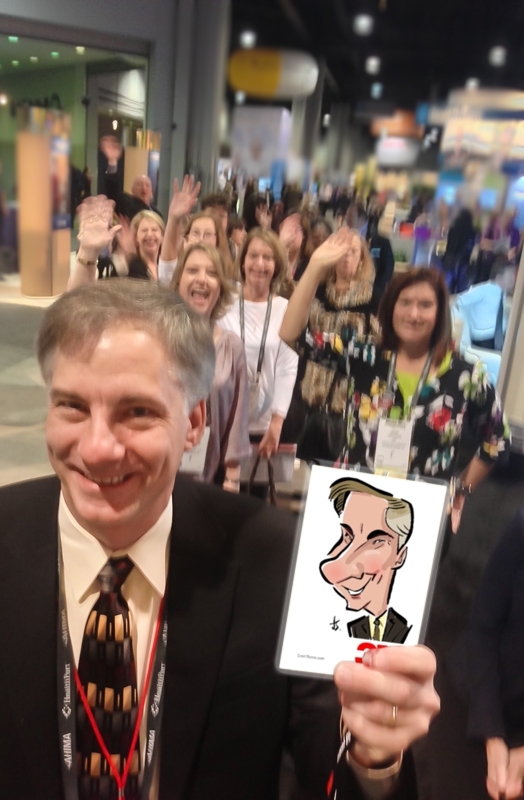 While we cannot guarantee a queue of 50 like you'll see in a couple of photos in this gallery, we will assure you that as the conference or trade show progresses, word-of-mouth spurs a rising demand. And this demand builds year-to-year. Clients like 3M have had us back five years running and the queue is always at least a dozen deep from the moment each day begins until the close. As the subject sits down, typically the artist will hear, "I know it will be worth the wait." Music to our ears! If you want to build booth traffic or create community, give attendees what they want, personal interactive entertainment they'll cherish and share with their peers.